The Legend of Zelda Symphony of The Goddesses – Second Quest – Sulyma Productions Inc.
As part of The Legend of Zelda: Symphony of the Goddesses 2013 world tour, the acclaimed concert returns to the Southern Alberta Jubilee Auditorium in Calgary for one night only, Friday, October 11 at 8:00PM with SECOND QUEST. Once again capturing the hearts of video game enthusiasts and music lovers – following the success of the 2012 engagement of The Legend of Zelda: Symphony of the Goddesses, concert goers in Calgary will journey back to the land of Hyrule and enjoy an all-new season of breathtaking visuals and music, exploring additional chapters from The Legend of Zelda franchise, as well as preserving the beautifully orchestrated four-movement symphony from last season, including the classic storylines from The Legend of Zelda: Ocarina of Time, The Legend of Zelda: The Wind Waker, The Legend of Zelda: Twilight Princess, and The Legend of Zelda: A Link to the Past. The Legend of Zelda has sold over 62 million copies and has entertained generations with more than 25 years of magic and adventure. Witness the video game series come to life as this dynamic cinematic video presentation is synced to Zelda’s sensational, action-packed music performed live by a live symphony orchestra. Fans will relish in their favorite moments from the game, carefully and beautifully timed with the gorgeous, larger- than-life orchestral score. The concert is a festive event for all walks of fans, who are encouraged to don their Hero’s tunics and Master Swords for the experience of a lifetime. A complete tour schedule and additional information is available by visiting www.Zelda-Symphony.com. 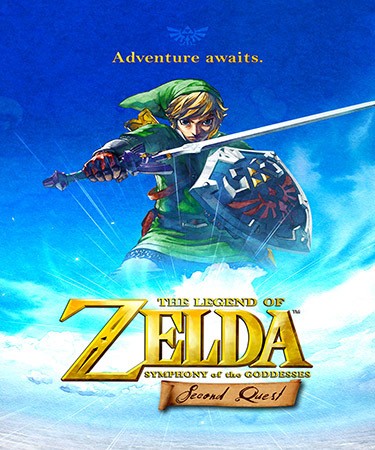 The Legend of Zelda: Symphony of the Goddesses – SECOND QUEST is produced by Princeton Entertainment and Jason Michael Paul Productions in association with Sulyma Productions Inc.